28th February to 13th March sees the annual Fairtrade Fortnight and to inspire, Skin Deep has selected a few Fairtrade beauty products. 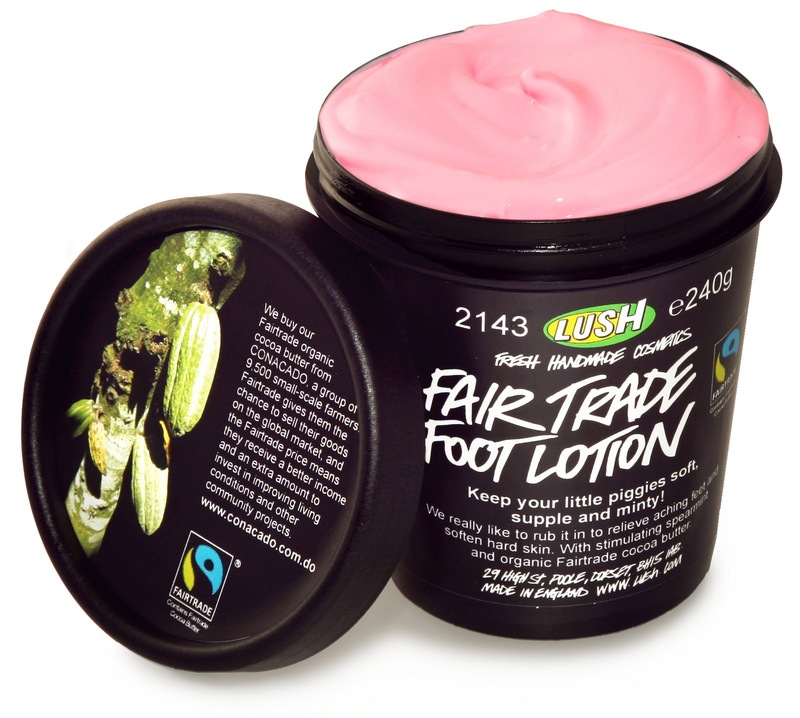 First up is the deliciously pink Fairtrade Foot Lotion from Lush. It's the best foot moisturiser I've tried to date﻿- choc-minty fresh and easily absorbed. Many foot creams claim to be revitalising but this really does the job & I can certainly attest to the fact that it's perfect for perking up tired feet after hours in killer heels. It contains almond oil so offers much needed super conditioning benefits after a winter of neglect. Every ingredient in Lush Fairtrade Foot Lotion which can be Fairtrade, is so you can be safe in the knowledge that you're not walking over others in the quest for tip top toes. Next up, L'Occitane, a brand which I always consider to be quite ethical with Braille featuring on the packaging of many of their products and various charity initiatives. Many of their products comprise Shea Butter, including Shea Butter Ultra Rich Body Scrub (accounting for 10% of the formula) which launched at the end of January. Scented like baby cream, the scrub has a wonderfully rich texture which feels cooling on skin. Despite the exfoliant being finely ground nutshells, it's not too abrasive, rinses easily and leaves skin feeling soft. L'Occitane source Shea Butter from Burkina Faso in West Africa, where a women's cooperative works to produce the moisturising wonder ingredient. L'Occitane has worked with the women since the 1980s and the co-op has grown from approx 100 women to over 12,000! Last but by no means least is Neal's Yard Remedies' Sensual Jasmine Body Oil which contains Fairtrade apricot and Brazil nut oils, the latter of which is sourced from Peru. Being obsessed with Latin America together with the fact that Jasmine is one of my favourite scents, this was always going to get the thumbs up from me and upon trialling, it didn't disappoint.